All Boutique Bracelets are handmade with close attention to detail. Made of sterling silver, cats eye/fiber optic beads and hand created clay beads. Each bracelet comes with a "Grow with Me" chain extender that allows the bracelet to grow with the child and to continue to fit her comfortably. 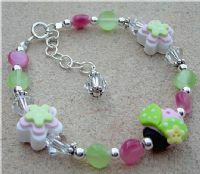 NOTE: This bracelet should not be immersed in water as the clay beads may break down.